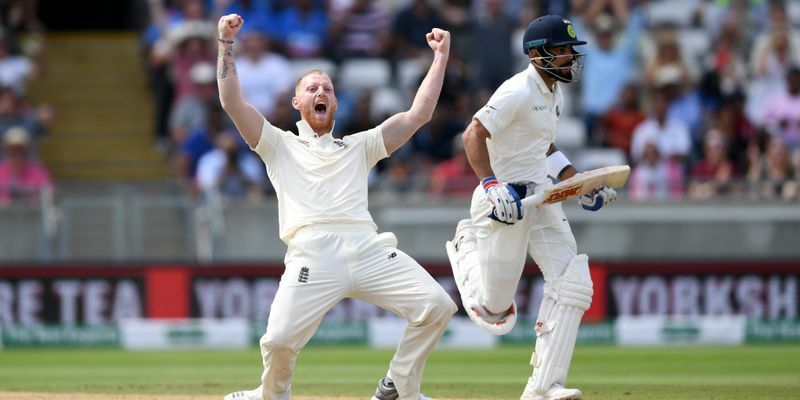 Ben Stokes came, saw, and conquered the Edgbaston arena and secured four wickets, including that of Virat Kohli, to help the hosts secure a 31-run win and 1-0 lead in the series. Chasing a score of 194 runs, India faltered towards the end and eventually ended up scoring 162 runs on Day 4. Brief Scores: England 287 & 180 beat India 274 & 162 (Virat Kohli 51; Stuart Broad 4/40) by 31 runs. After winning the toss, England decided to bat first with the hope of putting up a decent total on the board, but that was nipped in the bud by the wily Ravichandran Ashwin, who dismissed Alastair Cook with a classic delivery that pitched on good length and remained straight enough to rattle his stumps. However, Jonny Bairstow and Joe Root forged a 100-run partnership for the fourth wicket and were looking good for many more, but Virat Kohli, fielding at short mid-on, chased the ball and ran Root out with a brilliant direct hit. India sensed an opportunity and came out all guns blazing with Ashwin, within a space of 26 balls and 8 runs, reducing England to 224/6 from 216/3. Adil Rashid and Sam Curran provided some late fireworks with a 35-run stand, but Ishant got rid of Rashid and Ashwin soon got his fourth with a quick straighter one that rapped Stuart Broad's pad. Anderson and Curran played the last couple of overs, with Curran getting a reprieve from Dinesh Karthik, as England went in at 285 for 9 at the end of the play on Day 1. It took just 1.2 overs for India at the start of the second day to wrap up England’s first innings. For England, Sam Curran was at his sublime best and troubled the Indian top-order on his way to register a career-best figures of 4/74 while pace spearhead James Anderson (2/41), Adil Rashid (2/31), and Ben Stokes (2/73) dismissed the rest. But, nothing made for a spectacular viewing than Virat Kohli, who took on England single-handedly to notch up a sublime hundred and guide India to 274 in the first innings. The Indian skipper, who was dropped twice on his way to his first fifty-plus score in England, amassed 149 - highlighted by a solid thoroughness, artistery, and struggle. It helped India escape a hounding on the field and left them with a narrow deficit of 13, when at one stage 100+, even 150, looked on course. Far more importantly, Kohli got excellent support from Ishant Sharma and Umesh Yadav, without which India couldn’t have scored as many runs as he did in the first innings. The game was evenly poised by then and the Indian bowlers had to step up to the plate to make the opportunity count. Ishant started the day on a great note as his impeccable line and late movement from good length brought the English to their knees. After Ashwin delivered again, the Delhi pacer dismissed Dawid Malan to accelerate England’s collapse. Ashwin, besides removing openers Alastair Cook and Keaton Jennings, also managed to get the prized scalp of Root at leg-slip. However, England’s spineless batting also got some respite as Curran scored a fighting half-century to drag England from 87/7 to 180/10. Chasing a target of 194 to win the thrilling match, India lost their openers cheaply as Stuart Broad, who were ineffective in the first innings, became the threat that he is know to be. KL Rahul's stint at number three brought him no further joy as he crawled through to 13 before edging Ben Stokes to the keeper. However, Kohli hung in there tight and amidst the regular fall of wickets at the other end, and found an able ally in the form of Dinesh Karthik as the duo guided India to 110/5 at the end of the day, with India needing 84 runs to win. Dinesh Karthik and Virat Kohli had a difficult task of nullifying the English pacers, but just within one over, DK edged one to the slips to push the game back in England’s favour. Kohli was seen struggling in the middle and it was Hardik Pandya who needed to don the role of aggressor and after few jittery moments, he came to his own and hit some eye-catching boundaries to keep India in the game. However, Ben Stokes had other plans as he dismissed both Kohli and Mohammed Shami within a space of three deliveries to tilt the game in England’s favour and it was only a matter of time before they sealed the win. However, Ishant Sharma delayed the inevitable by hitting two boundaries, before Adil Rashid trapped him plumb in front to spell the death kneel of the Indian run-chase. And when Hardik Pandya was dismissed by the brilliant Stokes, England were all smiles for securing their second victory in the last ten Tests.